I did make some festive food for dinner. I was in the kitchen all day, and I had the mess to prove it. (Dang, I forgot to take a picture of that.) We had Touch-Down Taco Dip with our Quesadillas. I also made some pies for dessert. I know it's not really football food but we weren't having a party. Here are my tasty pies. Let me be the first (and maybe the only one) to testify regarding the tasty pie. 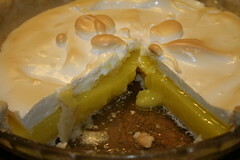 The Lemon Meringue pie is off the hook! I mean it's quite tasty. It was a really great game and there was plenty to cheer about, well unless you were rooting for the Patriots. the pies look yummers! Your post cracked me up Kelly. Im with you on the cute shirt and not so much into sports. Erick is not a big sports watcher! and I love that about him. but we watch maybe one sporting event a year. The super bowl was it! Even for a non fan, not knowing much about the teams, I took Erick's suggestion to root for the underdog! Soooo glad I did. It was a fun game to watch - I agree Mickey, lots to cheer about! I was amazed at some of the plays. Commercials were so so. I ate too much. By the way I've meaning to tell you how impressed I have been with your posts. You put a lot of thought and do a lot of research in finding good links. Thank you for documenting all these events. And darn why didn't I have another piece of pie yesterday? Piiiiiiiieeeee .... must have Pie(using my best Homer Simson voice) Those look great Kelly ... any chance there is some of that chocolate pie left ????? I too must confess to watching the last quarter of the game. Lots of great plays and good sportsmanship from both teams. Although I did watch the Lost In Space movie during the first part of the game. Sweetie, I don't think you needed a piece of pie after eating that cinnamon roll for FHE last night. You can have a big piece today. I'll make sure to save it for you. 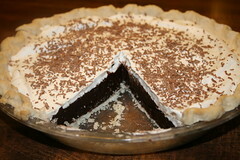 Mike, there is some chocolate pie left but since school got canceled today I doubt it will be around for long. Wow, that project looks awesome! Being the knitting-idiot I am, I can't tell what it is. But the colors look awesome! Oh, by the way I guess I had a good teacher to help me along with all the blogging stuff. Thanks for the compliment. Then you'll just have to be surprised, Janel.